Take a standard ISO shipping container in a 20-foot or 40-foot length and your starting point immediately gives you a durable and secure environment to begin any transformation for your next storage, business or industrial living project. These structures provide an environment that requires no structural foundation beyond a level surface to stabilize it. With the addition of a variety of options, you can begin to transform your conex box into the vision you have desired. Whether it is climate-controlled storage, an off-site full functioning office, or living space for your remote workers, a modified shipping container could be the ideal solution. Diversity in business needs requires diversity in business solutions. The initial step of selecting a shipping container for your next project is a solid one. These structures offer the ideal environment to be transformed into a business solution to assist with your organization’s goals. A standard container allows you the starting point to provide versatile useful space for your storage needs. With 16 gauge corrugated steel and locking ability, it doesn’t get much more secure then this for your valuable items. Access to this structure can be enhanced with roll-up or personnel doors. Moving to a climate controlled storage container for a space that protects those temperature sensitive products or electrical equipment to be stored for maximum product life and functioning. The open container office takes all of this a step further. Interior walls can be finished and divided space can accommodate multiple business functions inside the modified shipping container. 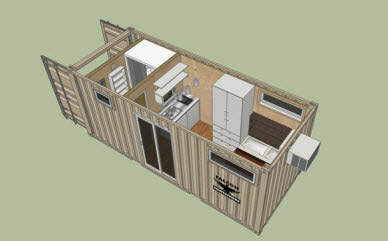 Plumbing can be added and enhancements to the interior with a Living Container to allow for your off-site workers to have a functional and comfortable living environment at their man camp or off-site industrial work environment. You may need to add specifications beyond the standard offerings and we have developed a resource to assist with your next project. Download our Five Steps to Designing Your Modified Shipping Container and follow our recommendations, which take into account our experience in working with a variety of diverse businesses and business applications.